The Omni Cancun Hotel & Villas has 343 luxury suites and villas. All feature gorgeous views of either the ocean, lagoon or tropical gardens. Deluxe Rooms include one king or two double beds and lagoon or garden views. Premier Rooms offer similar sleeping arrangements with an upgraded view. Executive Suites offer one king or two double beds, an over-sized living room and wet bar. Presidential Suites are located on the top floor and offer a full living and dining room, kitchen, master bedroom with king bed, Jacuzzi tub and balcony. An additional bedroom with two double beds can be connected to the Presidential Suite for additional guests. Luxury Three Bedroom Villas are located in the lush tropical garden pool area. Each villa is approximately 2000 square feet and offers a dining, living room and kitchen on the first floor and 3 bedroom with private bathrooms on the second and third floors. 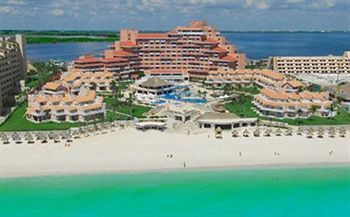 The Omni Cancun Hotel & Villas is a 100% All-Inclusive Resort. This means all meals, snack and beverages are complimentary. Dining options include an enormous variety including seafood, sushi, Italian, American, Japanese and of course, Mexican. Restaurants on premise include Restaurant La Paloma, Restaurant Pina Colada, Viva Mexico, Sushi Bar, Pool Grill, Swim-up Pool Bar, Lobby Bar, Kuku's Jacuzzi Beach Bar, Trattoria, Restaurant Da Vinci and 24-hour Room Service. Resort activities abound at the Omni and there are 3 cascading pools where you can swim, enjoy a beverage and relax. Whether soaking up the sun's rays poolside or on the beach, you will enjoy a pristine ocean view. When you're finished by the pool you can relax with a spa package at the on site full service spa. There is no shortage of luxury at this resort and no reason not to make pampering yourself with Omni an annual tradition. An Omni Cancun Hotel & Villa timeshare resale will ensure you come back year after year and save you thousands of vacation dollars.